A big congratulations to Janette Davies, who has followed up her success with Hey!Zeus!, a collection of humorous short stories, with her first novel, The Great Big Spanish Adventure. This is a romp through the lives of six families living in the same apartment building in Spain, and I have to say there’s a little bit of something for everyone. You’ll find laugh-out-loud moments easily mingling with dark and suspicious scenes, as well as characters easily mingling with each other! You’ll also find a fantastic international flavour in this novel: characters come from England, Spain, Russia, and Greece. Davies weaves their personalities and characters well, in a plot that will have you turning the pages ever quicker. I really don’t want to give too much of the story away, but there is a terrific ‘marriage of convenience’ that has friends gasping in amazement and will have you holding your sides. But you had better be ready to grab for the tissues too. Just saying! Janette launched the book at her local bar, just round the corner from a hairdresser’s that gave some inspiration for characters and subplots. Though the event was held on something of a cold day – strange for Spain – plenty of people attended and were rewarded with signed copies of The Great Big Spanish Adventure. We wait to be told whether any of the plot might be just a tad autobiographical. Read it and you’ll see why we ask! The Great Big Spanish Adventure is available to purchase on Amazon and Kindle: just click on the cover below. We’ve done it again! November’s issue of Writing Magazine carried a ‘Spotlight On’ feature of WordPlay Writers. I leave it to the article to do the talking for us. Margaret is still in the UK recovering from a broken bone in her foot, and we all wish her well. last night on Kindle ‘Precinct Murder’ six New York murder stories. Authors: Joy Lennick, Maggie Hegarty, K.J.Rollinson, Drummond Marvin, Gerald R.Wright and Warren Kent (Michael Barton). $4.99. Also available in paperback. Any one who would like copies to email wordplayenquiries@mail.com by 20th November at the latest. Should then arrive by next meeting. ‘The Great Spanish Adventure’ Author – Janette Davies Book launch 16th Nov. ‘Friendly Bar’ Citrus Centre, Playa Flamenca. Congratulations – two books in a year. Opportunity for other members publications to be available at the Bar. 2. WEB SITE – Apologies for lack of input but will be updated. Search Engine Optimisation – having dropped off social media, within two weeks there was a drop of 80% hits – Twitter/Facebook. Social media really important – Workshop 25th November 11 a.m. at Emerald Isle. An Australian client confirmed that by adding # to his tweets, increased his site hits by 40%. Get it on your Tweets! Janet Pogson queried quantity of search hits without the ‘ok’ marker on Google when searching under WordPlay, and also the number of other WordPlay’s out there. Very little we can do about the other WordPlay sites, but Michael will look into the security issue. 3. KINDLE DIRECT PUBLISHING – Amazon news. It appears that Amazon have been increasing its minimum list price on paperback self-published books, possibly pushing to get rid of paper backs in order to turn to Kindle? Kindle introducing ‘match book’ – if you have published a paper back you can tick ‘match book’ and its owners will be able to buy the Kindle version for at least half price. Reminder: A Prime Amazon member can ‘borrow’ one book each month. ‘Kindle Fund’ – if your books are borrowed you get a proportion of the fund. A few members earning more this way than sales. ‘Count Down’ deals – a period where author can set price and the availability of that book at that price is ‘counted down’. 4. KEY WORDS – Kindle have a ‘Help’ page. Go for less popular words, can be short phrases, and look at less competition. Book tracking – see website. Kathy was congratulated – used key words, and during a 5 day free period, did considerable tweeting and got into first 100 list. Janet Waters also congratulated; her book ‘Truth Hurts’ has had 1,000 Kindle downloads in six months, November royalties donating to Philippines disaster fund. 5. ANNUAL DINNER – February 2014. Organiser needed. If non volunteer forthcoming in two weeks then Michael will organise. 6. BOOK WEEK – see newsletter, and come back next month with your thoughts and ideas. 8. COLLABORATIVE NOVEL PROJECT – will disseminate on newsletter. Next meeting 9 December 2013. Sometimes as writers we find ourselves wanting to do our bit, in whatever small way that might be, to help our community, or the community thousands of miles way. It might be an individual, or a cause, a charity, or club or school… there are a million reasons why we give our time and talent. A couple of years ago I wrote a story for the anthology 100 Stories for Queensland, a worldwide collaboration to raise money for the victims of the terrible flooding there. Last year, WordPlay posthumously published Keep Write On by Ian Govan (with a small contribution from myself), with 50% of the proceeds going to Alzheimers charities in the UK and the remainder to an award for writers, the Ian Govan Award. Earlier this year, one of our members Peter Hayward, undertook a sponsored hike in Jordan to raise money for the Macmillan nurses, and WordPlay was happy to donate. Now, another of our writers, Janet Waters, is donating the proceeds from her book for a good cause. She wrote to me late last night. “My nephew’s new bride was brought up in Tacloban in the Philippines, where Typhoon Haiyan has struck with such devastation. Her grandmother and family still live there and until this morning we did not know if they were safe. Thankfully this morning we received the news we had been waiting for – they are safe. During the month of November, all proceeds from the sale of Truth Hurts will be donated to the emergency fund to help get Tacloban and the surrounding areas back on their feet. If you are looking for something to read and at the same time would like to help this worthy cause, please download my book in November. So here’s a challenge to everyone: let’s see how many copies of Truth Hurts can be sold over the next 18 days. Tell your family and friends about it and tweet it and Facebook it and Tumble it. Present: Evie Barton, Michael Barton, Jan Davies, Peter Hayward, Maggie Hegarty, Migel Jayasinghe, Lynda Kiss, Joy Lennick, Ann McCall, Dave McCall, Ann Mancey, Drummond Marvin, Kathy Rollinson, Margaret Rowland, Joanna Rich, Georgia Varjas, Janet Waters and Gerry Wright. Michael welcomed new members, Ann Mancey, Ann McCall and Dave McCall, and introductions were made. These amount to 31 Euros and monies were distributed at the end of the meeting. Michael mentioned that authors should push sales through Createspace, as it gives a higher rate in royalties. It was agreed that the £250 cheque received from the Writers’ Magazine will go into the bank account and will be used to promote the group or for a future group event. Michael continues to work on this and is actively encouraging traffic through it. At present he is using very little Search Engine Optimisation (SEO), and believes its traffic driving relevance will be usurped by other methods in the future, such as social media networks: Twitter, Facebook and others. However, he will be increasing the SEO work he is doing on the site over the coming months. He mentioned that it helps Search Engines if you put links in. Michael is linking internally with the aim of keeping people on the site longer. 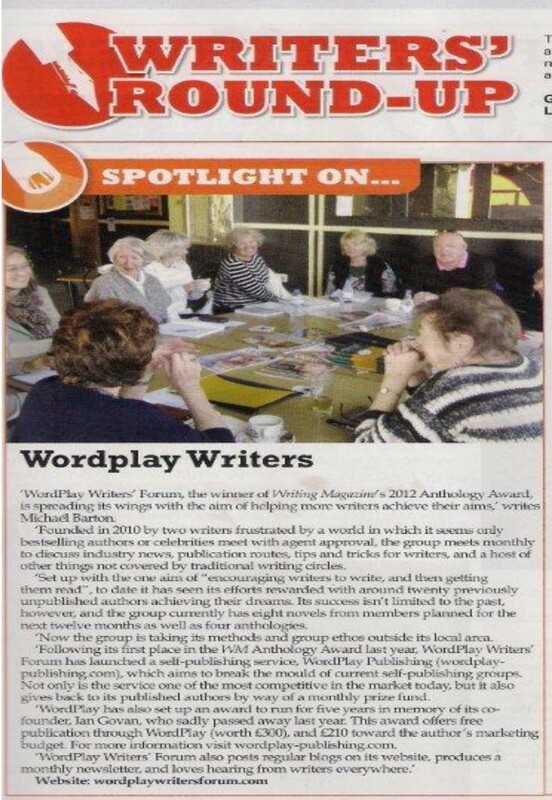 WordPlay have also started a monthly newsletter. To begin with this will be for members only, but eventually this will be for site followers. Dave McCall mentioned that he produces a newsletter each month to promote his work and he keeps his own e mail list. Readers are interested in what the writer is doing. When creating a blog, you need to be clear in your own mind what you wish to communicate. You need to decide if you wish to inform, engage your reader or do both. Postings need to be done regularly otherwise numbers will drop off. They should not be too long and an ideal of 400 – 500 words was suggested. Other suggestions to enhance blog: subtitles, title each paragraph, use bold text, use bullet points and images can improve the message and presentation. Think about a ‘Call to Action’ on each post. For example getting readers engaged by conducting a poll. if you have a website, get blogging, and link to your fellow members blogs/ websites – because we need to work as a group to drive sales. Try to drive traffic to your website through Wordplay. Targeted traffic numbers remain at 1,000 hits on the website per month in December. However, we have already passed 500, and hits are growing at around 20% per month. With some SEO work, and other methods employed, Michael believes it likely to break through our target by November: when we can start working on our big target of 1,000 hits per day. In November three anthologies will be published: Winter Gems, Lifetime of Childhood and Precinct 22. The intention is to publish another anthology in March/April 2014. Michael asked members to volunteer to oversee this project. The work entails: choosing a theme; deciding on parameters and genre; collating; and producing a timetable (stories will need to be completed by the end of January). Thanks go to Drummond and Gerry for volunteering. Another project was mentioned: there is a competition which is held each November with the aim of writing a novel in a month. It could be a group effort and creation. The following procedure was suggested: chapter 1 on Website; another member writes chapter 2 and so forth. Members who wish to be involved would create a Wordplay novel. Michael will put something in a newsletter concerning this and will ask for a response from members. Dave McCall had a book launch at Guardamar library and Michael invited Dave to explain his approach. Dave suggested that it is not a good idea for the author to read from his/her book. The audience are usually more interested in the author at this stage and the aim is to adopt a personal approach and inspire and intrigue the audience. The location of a launch is very important and, where possible, the author is advised to choose a location which has some connection to their work. Georgia mentioned Toastmasters and gave out information about the next meeting and change of venue. This has proved an excellent platform for her work and she urged other members to attend. Miguel has had his book of poetry published and was congratulated by the group. Present: Evie Barton, Michael Barton, Jan Davies, Nikki Dee, John Francis, Peter Hayward, Maggie Hegarty, Migel Jayasinghe, Joy Lennick, Drummond Marvin, Kathy Rollinson, Margaret Rowland, Joanna Rich, Georgia Varjas and Gerry Wright. Michael welcomed new and returning members: Migel, John, Joanna and Janet. Each person introduced themselves and gave us an insight into their work and experience. Michael explained that they were joining a diverse and talented group with experience in many different genres. Michael requested an up- to- date list of e mails and telephone numbers. Monies were distributed. In June, every book on the list was sold via Kindle. Kindle books are outselling tree-books by four to one. It is presumed that prospective readers have visited the site and looked at the Anthology. There have not been many sales of “Shorts for Autumn” but this has linked them to the novels of authors listed and has resulted in sales. Since the first quarter, the number of hits on the website has increased exponentially. The ultimate target is for 1000 hits per day to the WordPlay website. Michael has published a collection of Ian’s articles from CBN: “Keep Write On”. 50% of the royalties will be contributed to the Ian Govan Award and the other 50% will be donated to Alzheimer’s. Next year Michael has offered to publish a book for a Children’s Charity for free in exchange for acknowledgement of Wordplay Publishing. At the last meeting, members were asked to research marketing/publicity opportunities. Kathy filled in the forms for Kinship.com but this contact was unsatisfactory. Georgia has gone down a different road. She is a member of Toastmasters and has promoted her books at these meetings. There are Spanish members and, because they want to become proficient in the language, they are interested in English authors and books. She is doing two University gigs in September and, from past experience, is confident she will sell more of her books. Self- marketing requires a lot more effort but is proving successful for Georgia. Gerry called in to the Euro Weekly offices in Benijofar concerning Wordplay’s Award but there has been no feedback. U3A will mention the group and the Award on their Website and will include a link to ours. The overriding message was that members have to fully utilise social media in order to sell themselves and their writing: blogs, websites, facebook, and twitter. Members have to use strategies to get their books into ratings: interact with readers by enabling fans to contact characters from novels on facebook; offer your book free on Kindle for a few days; or offer three books for the price of two. Michael helped Jan with the publishing of “Truth Hurts”. She put it on to Kindle and the original price was £1. She then raised it to £1.98 and put it on for free for two days. Her strategies paid off and her sales ratings increased. Jan highlighted the advantages of using Goodreads, a free website for book lovers, and members are urged to review each other’s books. Georgia has approached Talk Radio Europe and has set up a pre-recorded interview. Cathy has investigated Sunshine Radio with a view to publicity. Sunshine Radio invites local people to contribute. As Michael is away for a month, it was decided to postpone this until early autumn. Nikki has produced a press release and has submitted it to several publications. Michael read it to the group and it was agreed that it hit the spot: targets audience; has a personal angle; and advertises her novels and short stories. Carol Naylor, a former member of Wordplay, has approached Michael and offered to review books. She produces reviews and enters them on different websites. She is interested in promoting local authors and will not charge for reviewing our work. Linda Kiss would like us to consider holding a Book Week next year. We need to start thinking about this and Linda wishes to include it on the next agenda. Bring ideas for a ‘Book Week’ to the next meeting in September. 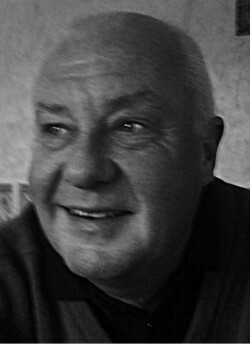 Ian Govan Award – Writers are invited to write a novel, in any genre; the name of the hero has to be Ian. Ian’s point was that it was a very unlikely name for a hero. Entrants should submit first three chapters and a character study of the hero, Ian. In November Michael is visiting England and Scotland and will be involved in a tour of writing groups. He will be promoting Wordplay Publishing and, hopefully, spread the message in the U.K. I did what she meant! I had something of a scare this week, all due to a misplaced word or two. Now, I’ve spoken about misplaced commas and the damage they can do before. Who can read the faux pas ‘a panda bear eats, shoots and leaves’ without picturing a black and white ursine giant in a restaurant, having just demolished a rather rare steak, pulling out a handgun and randomly firing at anything that moves before he departs: bill unpaid, of course? But I digress. Back to the scare I wanted to tell you about. My wife – and at this point I had better make it plain that I love her to bits – set a message upon the kitchen side for our son the other morning. We had to go out, you see, and she-who-must-be-obeyed had put a load of washing on (a technical operation for which I am completely under-qualified). You can imagine my consternation (a lovely word, and one that I don’t get to use often enough) when my wife and I arrived home to see our son’s legs flailing mid-air, as he struggled in aggravated suspension from the balcony overlooking the garden. I realised immediately the mistake he had made, though her-indoors was not best pleased. “You know exactly what I meant,” she said as she stormed to the solarium. I, of course, made every effort to appease my better half and did what she had wanted done in the first place. I’m not really sure what her problem with me now is, though. She hasn’t spoken to either my son or me since I did as her written word commanded. And the washing machine is still hanging in the garden. Just goes to show: even when you read something and decipher exactly what it means, it can still get you into trouble. One year ago today, my very good friend, co-conspirator, and Birmingham City supporter (we all have a cross to bear) Ian Govan passed away. The previous afternoon we had enjoyed a few pints together – as was his whim to do so – and had chewed the cud about the world. I enjoyed our times together, mostly because Ian made me laugh. And he inspired me. Some mornings we would catch up for a coffee, talking all things writing and WordPlay, before reconvening after lunch. On one such afternoon, we got onto the subject of famous and great lines from the movies. An afternoon of chat, laughter, and guesswork that spawned the following article. This morning I’ll be having a coffee at one of our old haunts, before having three or four pints to toast him in the afternoon. I’ll round off the day with a glass of red wine accompanied by a pork pie. And all the while, Ian will be with me urging me to keep right on. So, what makes a great line? We spent some time this week, okay over a couple of beers, trying to come up with the most memorable film lines. How many did you get? Name the film, the actor, and the character. And so it goes on. Fabulous lines that resonate with all of us. But there is another facet. Lines that never happened. Apparently “Play it again Sam” was never said. Then there is yet another. “Elementary my dear Watson”, is said in the film but was never written in the books by Arthur Conan Doyle. Sometimes, the memorable bit is not even in words. “42” springs to mind. Her output is nothing short of phenomenal. Short stories, poetry, novels… you name it, she writes it. In fact, she’s non-stop from the minute she wakes to the moment she rests her head on her pillow last thing at night. You’re just as likely to see her out walking, playing bowls, or golf, as you are sitting at her computer tapping the keyboard. 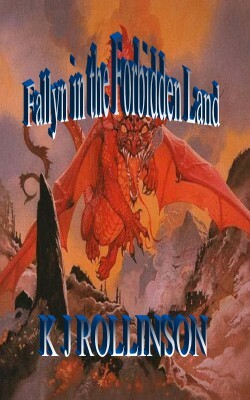 Here’s the first chapter of her second novel, Fallyn in the Forbidden Land, in the ‘Fallyn and the Dragons’ series. Fallyn heard a chuckle from the doorway, which he recognised as Kalla’s. He stood up and the startled cat scampered away. Voices outside the door announced the arrival of Fallyn’s twin sister, and their friend Merin. Within a few moments, there came a knock on the door and when told to enter, a servant ushered a dishevelled tall man into the room who bowed to Fallyn and the others. Solo, and his brother, a dragon called Draco, had been taken a few months ago from Dragons’ Cave in the province of Outha to Dragons’ Keep in the province of Orla, in order that the blind dragon, Draza could choose one of them as a mate. ‘I would have preferred her to mate with Solo but presumably she has not forgiven him for accidentally blinding her in battle,’ Fallyn answered. ‘What is your urgent news?’ Eila enquired. ‘We are not sure. There is no evidence Prince Bato is behind the attacks, although the small dragons do head towards the Forbidden Land,’ Smethro replied. ‘Small dragons! Attacks!’ Eila and Fallyn exclaimed together. ‘We should allow you to start at the beginning,’ Fallyn said, placing a carafe of water and cup on a small table beside Smethro. ‘Thank you my Lord.’ Smethro took a long draught from the cup, wiping his mouth before he spoke. ‘Small dragons have stolen a ship! Why? Who? Where did it go?’ Merin bombarded the exhausted looking Smethro with his questions. ‘How can a ship completely disappear?’ Merin exclaimed in disbelief. ‘How small are these dragons? Are you sure they come from the Forbidden Land?’ Fallyn asked. ‘They are about the size of a very large dog, like a Great Dane. They come in all shades of red and orange to almost an apricot colour, and spit flames like sparklers. As I said, a female red dragon leads them, which is bigger than the rest. They make a very pretty sight, if it were not for the fact that they can hurt you or a dragon if they get too near; fortunately the range of their flames is only a couple of feet. We cannot be sure they come from the Forbidden Land but they definitely make their way back there. At the mention of Dracito’s name Fallyn raised his eyes to the painting on the wall, which showed Dracito disappearing into the mist. Dracito had been only one year old when he died in battle. He had been a plucky, quick little dragon, whose willing spirit had made him a firm favourite amongst dragons and riders. Fallyn gave a small ironic smile as he thought Dracito would have been a giant amongst the dragons that Smethro mentioned. ‘Kalla, Eila, I do not want to leave you here alone. It would be advantageous to us all if you are both based at the palace in Orla. I was thinking if you were both near to the border of the Forbidden Land this would assist Kalla if we need her to shape shift and carry messages as a bird, and Eila, you and I would be able to communicate through thought transfer. It may be easier for us to get through to each other there.’ Fallyn looked at the two girls who nodded their agreement at his suggestion. ‘I hope we don’t have the same problems contacting each other as we had when I was captured by Bato, two years ago,’ Eila remarked and shuddered at the thought of her captivity before Fallyn and Merin had rescued her. ‘If they are not back we will fly on to the port. We will take ten dragons with us on our journey; this will provide us with a change of mounts, and some to carry supplies. I intend leaving Solo behind to recover from his journey from Orla.’ Fallyn paced the room, his hand on his dagger as if prepared for immediate action. Kalla escorted an exhausted Smethro to a guest room where the poor man collapsed on to the bed, without removing his clothes, and immediately fell asleep. Fallyn in the meantime eagerly went to Dragons’ Cave to visit Solo, only to find him sprawled in the hay fast asleep while golden Drartica, his adopted mother, licked his nose gently.